This is the last day of February, and leap year. It's tea time here at My Cozy Corner today. I will have most of the collection photographed. This tea cup and saucer has a dessert plate. I have two sets. My garden is clear of debris. beautiful green house flowers for the best price. the sides of the vase. Pink shortbread cookies for tea. I'm using the place mat as a napkin. One of my favorite tea pots. Spring is going to be here soon. A gorgeous Spring Tulip Tea Time, dear friend! I, totally, agree with you. . .I love draping tulips! Your tea cups are so lovely, Betty. Thank you for sharing on this Happy Pink Saturday! I love teat time on your blog, beautiful scape! What a beautiful set and so perfect for spring! I love it with the tulips! So glad you shared and greet you from Colorado! Have a lovely week. Your tea time really is lovely, Betty. Love the teacups and I too like tulips drooping or dancing in the vase! Love the teapot too. Such pretty images and thank you for sharing them with us. So pretty! The lace runner and placemats are a great find! Just beautifil Betty! Love all your pretty teacups and how nice to see your tulips...mine are about 2 inches of leaves at the moment! I think that's a clever idea to catalogue your teacups on Pinterest Betty. Glad I'm not the only one that uses placemats for napkins - thought I had purchased antique napkins until got home and saw they weren't. Oh, I'm in love with those cups!! Thanks for joining Home Sweet Home! Such a lovely tea. The cups are so pretty. 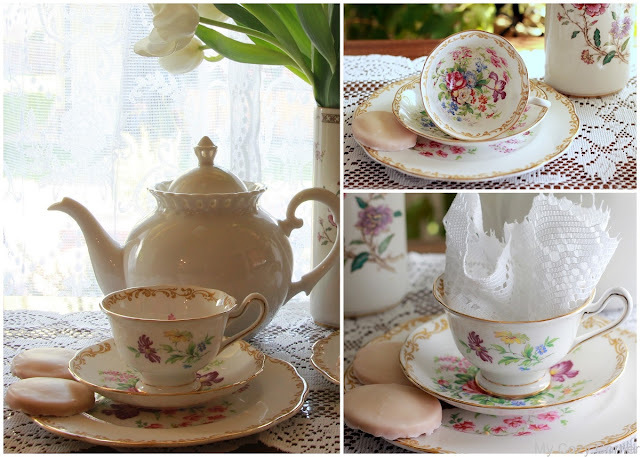 You created a beautiful setting for the tea with the lace and the tulips. Thanks for sharing at DI&DI. Those tea cups are gorgeous. Thank you for sharing them with us.